The Japanese economy is currently in the middle of a huge transformation. A generation ago, a Japanese person could finish school and seamlessly transition into a company job. The job might have grueling hours, but in return it offered lifetime employment at a good wage. Japanese men sacrificed their time with their families so that they could reliably provide for their families. Fast forward to today: production has shifted to China, Japan has endured a period of low economic growth and few jobs promising lifetime employment exist. Young people in Japan face an uncertain future as they fight for jobs that promise temporary employment at best. [C] Control styles itself as a show about economics that focuses on the big issues of the economic future for Japanese youth. Whether it can address those questions successfully, even as it spends much of its time on fights between monsters, remains to be seen. 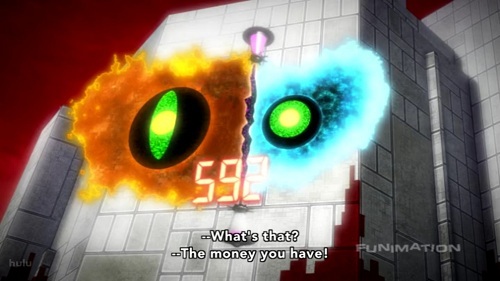 The monsters in the show are avatars (called assets), controlled by their human masters, that duel in a special world called the “financial district”. The duels revolve around money. A person in a duel must spend money to let their avatar launch an attack. If the attack hits, then the person makes money. If a person is hit by an attack, then he or she loses money. Even though a large bank account may give a person more power in a fight, skill still plays a role. For example, the attacks a person chooses and the person’s ability to evade attacks are important factors in deciding who wins the fight. Duels can end in two ways. First, each duel has a time limit. When the limit is reached, the duel ends. The duel also ends if either player runs out of money. If a person goes bankrupt then he faces consequences in the real world, generally death or worse. The concept behind this show is interesting and the battles are certainly fun to watch. Still, I wanted something more. The show has not lived up to the expectations I had after watching the first episode. 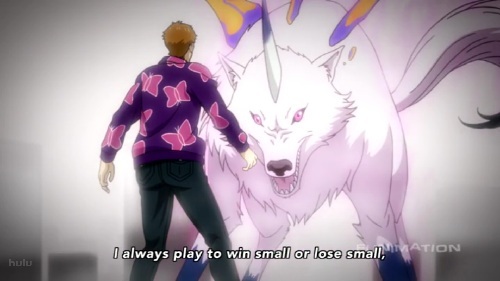 Life or death games can serve as interesting metaphors for real life, like in Battle Royale, but several anime have already extensively used this concept, including most recently Eden of the East. I was excited after the first episode because I thought this show had tapped a rich vein about Japanese life. I hoped it would explore how the Japanese are dealing with a new economic reality. The show tries to insert deep commentary about how the economy dictates people’s actions. But these comments seem hollow in a world where battles that could have come from Digimon, not the economy, are really what drives the world. I often feel, as I watch C that it and anime like Eden of the East are almost like open sores on an ill person – the tip of the iceberg, so to speak. So to me, I don’t really reel at the idea of two anime treading the same ground – they handle the situation from two very different slants (humanistic for EoE, situational for C) and seem to be attempting to say different things. To me, this is just underscoring the idea that something is very wrong in the rising sun. That said, don’t go painting a picture of Japan as ‘down and out’. Note the vast amounts of money in play in the world of C. This is no bankrupt nation, simply one in a slow period. Much like the UK, they still sit on vast amounts of wealth, even if they aren’t considered as much of a ‘world power’ perhaps as they were 20 years ago. This is a country where true poverty is hard to find, and whose people can afford to buy high-quality goods at high prices. An interesting note here is the somewhat hidden slant towards a younger audience. Though it airs in the Noitamina block at 1am, the content and execution of the Financial District is ultimately childish – the Yu-gi-oh meets the stock market comparison has been made elsewhere, so I’ll spare you. A huge issue which has arisen in Japan is the disparity in ideals, culture and wealth between the youth and the older generations. The other interesting note to make here is to contrast it to the other quite lovely Noitamina show airing currently – Ano Mita Hana no Namae wo Bokutachi wa Mada Shiranai. Ano Hana presents an obstinately idyllic version of Japan and Japanese youth culture, all while cloaking that same issue of the hikkikomori, or the alienated youth. I think the issue Japan is (and arguably should be) most worried about is not the present but the future. Right now they have a lot of money but their trajectory is pointed downward. Of course, they are in good company, most other developed country is also on a downward trajectory. The difference with Japan is that there problems predate the global recession. So the US, for example, may experience the same issues that Japan but likely not as soon. Your point about the slant towards younger audiences is really interesting, I wonder how a 13 year old would review the show.